Chantel Boyd approached me to take her business online. She didn’t have a website and wanted somebody she could trust to help her every step of the way. First and foremost the problem was that Chantel didn’t have a website nor did she have any real online presence. She wanted a website that reflected her business and services that would compete with the neighbouring business’ offering similar services. The main requirements were to bring in clients and serve as a “brochure” detailing what treatments can be had and at what price. Becuase there wasn’t an established website I had free reign on the design side of things. Chantel and I sat down and discussed the kind of ideas she had for the website and the colour schemes she had chosen for her print work so that we could bring both mediums together. We analysed the competition and also some of the top web designs in her field of work to get inspiration and see exactly what could be achieved! We decided that pastel teals and purples would set the right mood for the website and to reflect the business’ tranquil and relaxing nature. The CMS I chose to use for this website was WordPress. The reason was because it was a brilliant fit for it. I have an extensive knowledge in WordPress development and I could leverage some brilliant plugins to achieve some of the functionality required that didn’t come packaged with WordPress core. What did I do on this project? I designed the website from scratch using Chantel’s existing print work as a colour and style palette. I wanted to make the website set a high standard for all others in the same business to compete with. Using the latest tools and techniques I set out to create an advanced responsive website suitable for all devices regardless of size or browser. This meets all of the recommended development techniques as well as being mobile friendly and most importantly user-friendly. This website was built using the latest HTML5 and written in Sass using Bourbon framework and Bourbon Neat as a base. I used WordPress for this project as the basic CMS and built upon it to get the functionality the website required. 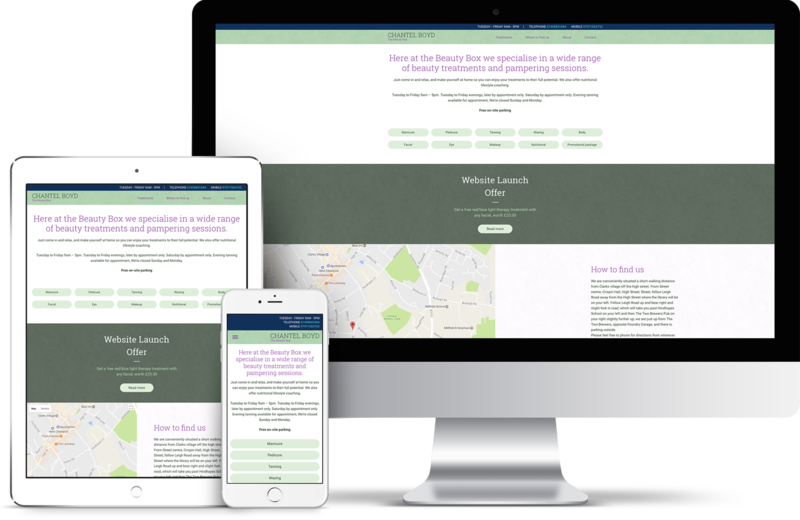 This is quite a large website but fairly straight forward, taking advantage of the basic WordPress functionality and adding some additional functionality including the ability to add treatments, track site traffic and optimise the website for search engines. Im constantly working on new and exciting things. Check out my web design and development portfolio with write ups on how each project was conducted. Looking for some great photography? Check out my latest photography write ups or browse the whole colection. Finally, I love to write. I write about everything from the web to photography to other subjects that interest me.